Trimode ring for Project GLITZ, The design project The uniqueness of Thai Jewellery Volume 01. Inspiration : Under the theme EXPLOSION, the designer sees an amicable co-existence of both the new and old elements in an urban community. With reference to the fun and merriment that are being celebrated within an acceptable social framework, the designer uses bright and bold colors on a simple form to allude to the contrasts in the society,that somehow manage to share their allotted spaces in relative harmony. Design Concept : The ring can be made either of sterling silver or anodized aluminum with stones cut in Triangle shapes to fit with the ring design. Colours of the stones are to be selected to produce a sharp contrast with the colour of the body of the ring . For examples, if the body is blue,the stones should be yellow-purple or green; if the body is green, pink stones should be used; if it is black, then the stones should be red, and so forth. 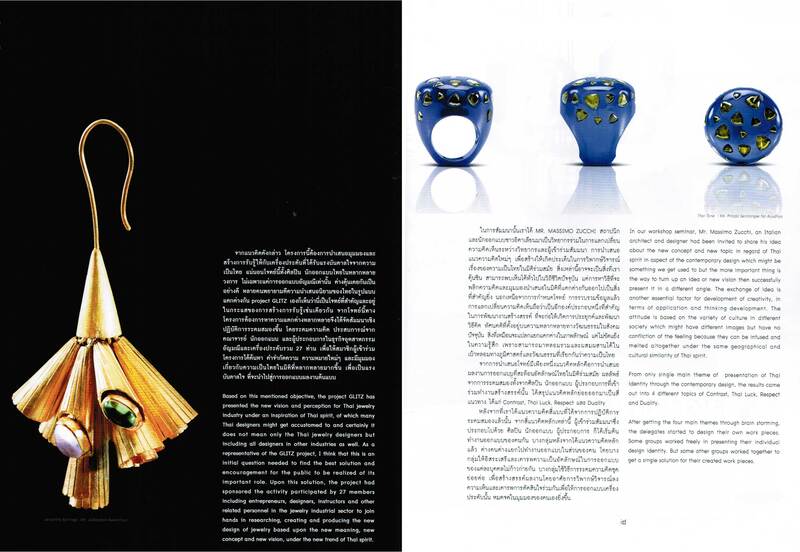 The curved form serves to indicate the warmth and friendliness of Thai people. The panel talk is part of the �“Sweets Knit Jewelry”exhibition presenting textile and jewelry designs inspired by Thai traditional desserts. The talk will start with a presentation on new material arrivals at Material ConneXion Bangkok by Chompoonuj Weerakitti, Director of Material ConneXion Bangkok. After that, two well-known professional designers and two design faculty members will have a casual panel talk, followed by the opening reception of the “Sweets Knit Jewelry”exhibition. 1. Rapee Leelasiri, a professional textile designer, from GRAPH-TEX studio Co., Ltd., for Rapee Leela Brand, a recipient of Designer of the Year Award, Silp Bhirasri Award, and All Great Design Awards 2007. 2. Pirada Saneewang N. Ayutaya, an up-coming and vibrant jewelry designer and a founding member of Trimode. 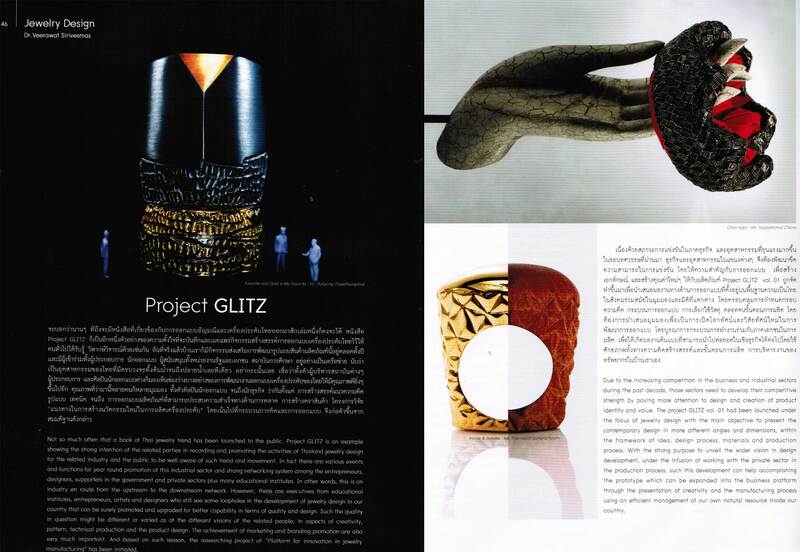 3.�Taweesak Molsawat, an educator, artist, and designer in Jewelry and Metalsmith from King Monkut�s Institute of Technology Ladkrabang. 4. Associate Professor Uraiwan Paradee (Pitimaneekul), PhD., an educator in design and a Textile (Knitting) specialist from King Monkut�s Institute of Technology Ladkrabang.